Atlanta-based Turnkey Construction & Roofing was tasked by a national contractor with one tall order: replace the roofing systems on six buildings for one of the oldest units in U.S. Army history. While the lineage of the unit can be traced back to 1825, the buildings are a little younger, dating back to the 1940s. “These buildings were originally part of a Georgia educational facility,” explained Karl Ek, vice president, Turnkey. “When World War II broke out, the U.S. military took over the property,” he added. 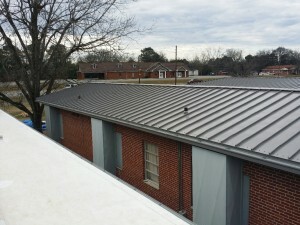 In order to fasten the new metal roofing systems onto the existing frames, the Turnkey teams had to, in essence, build a series of “false” roofing systems that were pitched, fasten those “false” systems onto the buildings and then fasten the new metal roofing systems onto the pitched systems. “In the end, we took six buildings with a variety of older and decaying roofing systems – none of them matching materials – and replaced them with solid, uniform metal roofing that will withstand the test of time and weather for decades to come,” Ek stated. Turnkey’s part of this project began in October 2014 and wrapped up this spring.